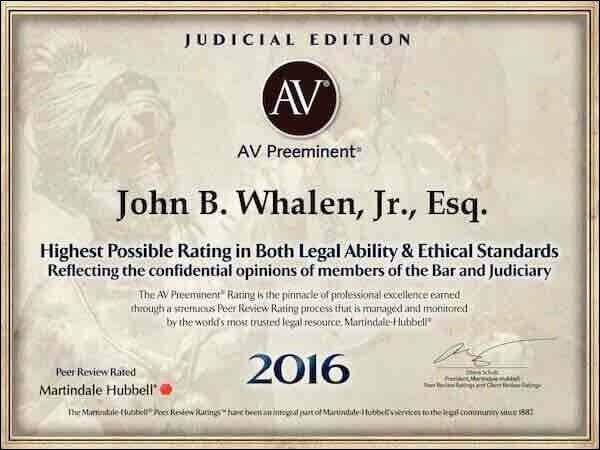 Congratulations, John B. Whalen, Jr., Esq. Your many years of hard work and sacrifice have paid off, and now you’re part of an elite group. For over 130 years, the Martindale-Hubbell® Judicial recognition from members of the Bar and Judiciary has distinguished the country’s best attorneys.2016 Martindale AV JudicialCelebrate your amazing achievement with the elegant Judicial Edition Plaque. This is a time-honored award that goes to the best attorneys in the country. It’s only fair that you exhibit such an outstanding achievement with your stately Judicial Edition Plaque.